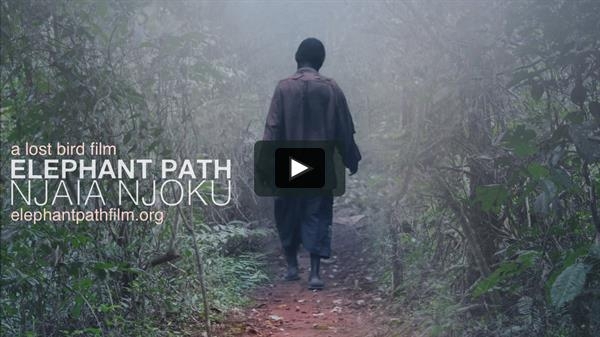 Lost Bird Films presents the documentary ELEPHANT PATH / NJAIA NJOKU, which will have its world premiere screening as a selection in the San Francisco Documentary Film Festival on Sunday June 10, 2108, at 12:30pm; followed by a repeat showing on Tuesday, June 12, at 9:30pm. Both screenings will be held at the Roxie Theatre, 3117 16th Street in San Francisco. The film’s director Todd McGrain and executive producer Andy Stern will attend both showings including audience Q&A after the film. INTERVIEWS: Director Todd McGrain and executive producer Andy Stern will be in San Francisco and available for in person interviews (dates tbd close to June 10-12), and are also available in advance by phone. REVIEWS: Capsule reviews are encouraged in conjunction with SF DocFest previews & critic picks. Online screener is available upon request. Dzanga Bai—village of elephants—is a clearing in the rainforest in a remote corner of the Central African Republic (CAR). African Grey parrots swoop and rare Forest Elephants congregate here to bathe in the mud and drink the mineral-rich water. But the lush canopy in the Dzanga National Park is not enough to keep the elephants safe. Political unrest, poverty, and greed fuel a poaching pandemic that threatens their very existence. Against a backdrop of luminous natural beauty, pierced by callous human violence, an American biologist, a Bayaka tracker, a Bantu eco-guard, and an Israeli security contractor form an unlikely alliance. As their lives converge on the paths of the last wild herd of forest elephants in the Central African Republic, each will be tested by the realities of war and the limits of hope for the majestic animals they have committed their lives to study and protect. With unprecedented footage, ELEPHANT PATH / NJAIA NJOKU intimately captures the beauty and behavior of this rare and elusive species of elephant. Todd McGrain (Director/Producer/Editor) turned his attention to documentary film after a 25-year career as a sculptor. His accomplishments as a sculptor include the prestigious Guggenheim Memorial Fellowship and the Audubon Award for Art Inspiring Conservation. His sculptures are part of several major museum collections in the United States and abroad. In 2010, McGrain’s work to create permanent public memorials to birds driven to extinction in modern times became the subject of a documentary film, The Lost Bird Project, produced by Middlemarch Films. This rewarding experience led McGrain to his current focus on the plight of the Forest Elephants of Central Africa. With his first feature length documentary ELEPHANT PATH / NJAIA NJOKU, McGrain shows his understanding of the value of storytelling to raise awareness of our current extinction crisis, that he has formed over decades of dedication and commitment. Andrew Stern (Executive Producer) is an Associate Professor of Neurology at The University of Rochester but now devotes himself fully to raising awareness about the environment through activities of The Lost Bird Project. Bayaka tracker Sessely Bernard is the primary voice of the film. Director Todd McGrain and DP Scott Anger planning a filming day in Dzanga Bai national park, Central African Republic. You are receiving this email because of your relationship with Steve Indig PR. Please reconfirm your interest in receiving emails from us. If you do not wish to receive any more emails, you can unsubscribe here.